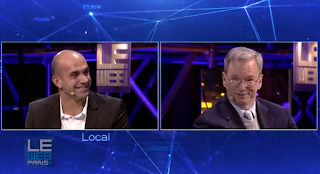 Droyd Cantina: Eric Schmidt At LeWeb: "Android is ahead of the Iphone"
Eric Schmidt At LeWeb: "Android is ahead of the Iphone"
As if we didn't know that. 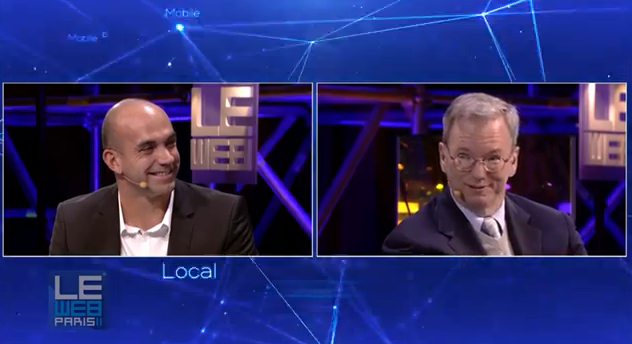 Schmidt, Chairman of Google, says at the LeWeb Conference, that Android is ahead of the iPhone. Loic Le Meur is looking kind of distracted. I'm glad that he gets this straight in his face, because I had more than one time a discussion with Loic, and the feeling he really believes that the Iphone is god. It isn't. God is dead, and little green robot took over some month ago. But I like Loic really much. Seesmic is awesome, and maybe this will get his priorities right, to maintain the Android-versions a little bit better than in the past. Android is NO.1, and should now be treated as such. Or there will no love from Android-users. That should be a warning for all developers. You want money? Treat you customers not 2nd class. Watch the scene at 37:00 min. of the video. Besides that, a little presentation of Ice Cream Sandwich and the Galaxy Nexus was made on stage. And of course he talks about Google+, too. I don't even link to the ridiculously biased article at Engadget. One of the last bastion of the Apple devotees, after Techcrunch Apple Fanboys got ousted. You wonder about the tone of this posting? Well I think many Apple-Fans need a reality-check. And if they know Apple's history, they should see a kind of bad omen here. We had this situation before. And it doesn't went too good for Apple.